Buy Ayur Dia Slim Tumbler Controlling Blood Sugar and Purifying Blood. 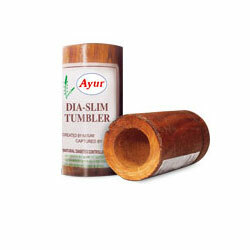 Ayur's Diaslim Tumbler is thus, a time tested and effective means of controlling diabetes. It is also a means of reducing excess fat from the body, controlling blood sugar and purifying blood. Vijayasar Wood, also known as Indian Kinotee by its Botanical name, has the power to control sugar level in the blood. It also helps to control weight-increase. In olden times, Ayurveda Treatment required the Diabetes patients to drink water, in which a piece of Vijayasar Wood was kept over-night. Then, Latin Naturopathy improved on the method by making a tumbler with this wood – an easier & practical way to achieve the same result, for the same purpose. Since ancient times, Ayurvedacharyas used blocks/pieces of Vijaysar to control diabetes. Pieces of Vijaysar were soaked in water overnight and in the morning, the same was sieved with cloth and given to the diabetes patient. Such a practice carried out regularly had dramatic results in controlling diabetes. Latin Ayurvedacharyas improved upon this method and prepared a glass of Vijaysar wood in which water was stored overnight and given to the patient in the morning. Scientists at Ayur tested this method in the research laboratories and found it effective. Ayur's Dia Slim blocks and Tumblers are made of vijaysar (India Kinotree). A natural Ayurvedic treatment to control diabetes. It has a magnificent role in reducing excessive fat from the body. It also controls blood sugar level & purifies blood. Fill the glass with drinking water and keep it overnight. The colour of the water changes to brown as it absorbs the properties of the wood. Drink the water in the morning on an empty stomach. Its time to replace your glass when water stops changing colour.